I blogged a few weeks ago about the newest furry edition to our household. Little Darla came to live with our family while her mom is away for a while, so we have quietly and not so gracefully been transitioning to life with two dogs instead of one. It's been quite the little adjustment, but having Darla around finally feels like the new normal, and we are all back to our daily routines. Parker works, I work, Jenny sleeps, and Darla runs around like someone fed her a dozen cupcakes. Yep, that's the norm over here! In all seriousness, going from one dog to two definitely took some getting used to, so I thought I would highlight the differences and some of the pros/cons of having multiple furry family members. I like to end on a positive note, so we'll start with a few of the lesser attractive aspects of having two pups around. 1. Learning a new dog. I have said this before, but I tend to think I know Jenny better than she knows herself. I have been around her almost every day for the last 3.5 years, so I've got her down to a tee. Adding a new dog into the mix that doesn't behave the same way as the one you're used to is bound to throw a few curveballs your way. One barks at random noises, one doesn't. One pees when she gets overly excited, one doesn't. One fights at the dog park, one doesn't. Little things, but things nonetheless. 2. Training a new dog. By the same token as learning a new dog, there is also training a new dog. Since Darla is going to be with us for a sizable amount of time, we knew we wanted her to play by our rules. Jenny is trained to our standards, so we don't have to put a lot of effort into her behavior. Darla is newer and needs a little more work, so we have had to devote time to get her where we want her to be. 3. The noise. Oh good grief, the noise. 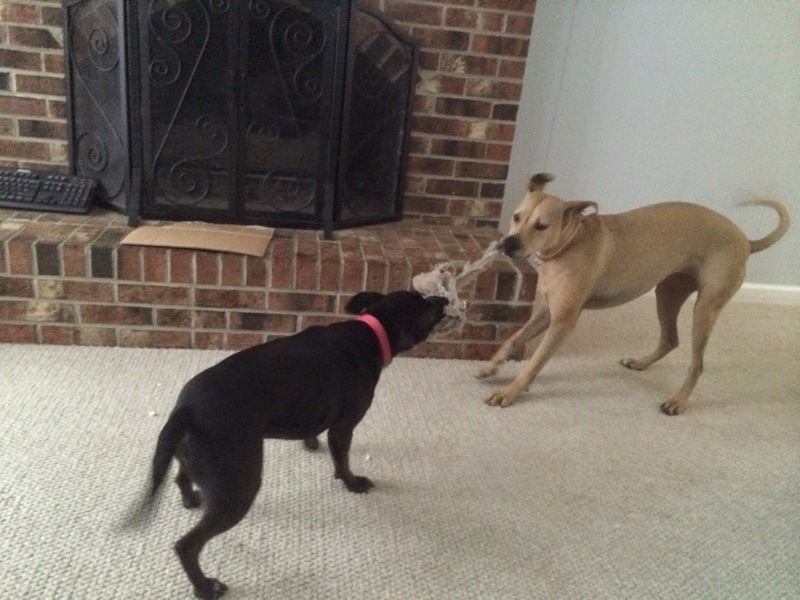 Jenny and Darla love to play, and I love that they have each other now. However, they have got to be the loudest players known to man. When they are wrestling or playing tug-of-war, it sounds like two cows getting run over by a lawn mower. So obnoxious. It wouldn't really be an issue if I didn't work from home. My job entails being on the phone throughout the day, and these pups couldn't care less. When you are in the room with them, they think they are putting on a show for you, prompting them to amp up the volume even louder. They're loud. Cute, but loud. 1. Built in playmate. I wondered how Jenny would handle having another dog around 24/7. Would she be jealous? Excited? Annoyed at the idea? Sometimes it's hard when they can't just tell you how they are feeling. I don't know if it is like this in all cases, but Jenny seems to love having Darla around. She's her built in playmate! 2. More love to go around. Bringing Darla into the mix has just increased the amount of love in our home. We have grown to love her, and I think she has grown to love us. 3. Giving another dog a good home. If you have read this blog long, you know we love Jesus and we love dogs. Being able to help out another pup and give her love and attention just makes our hearts happy. 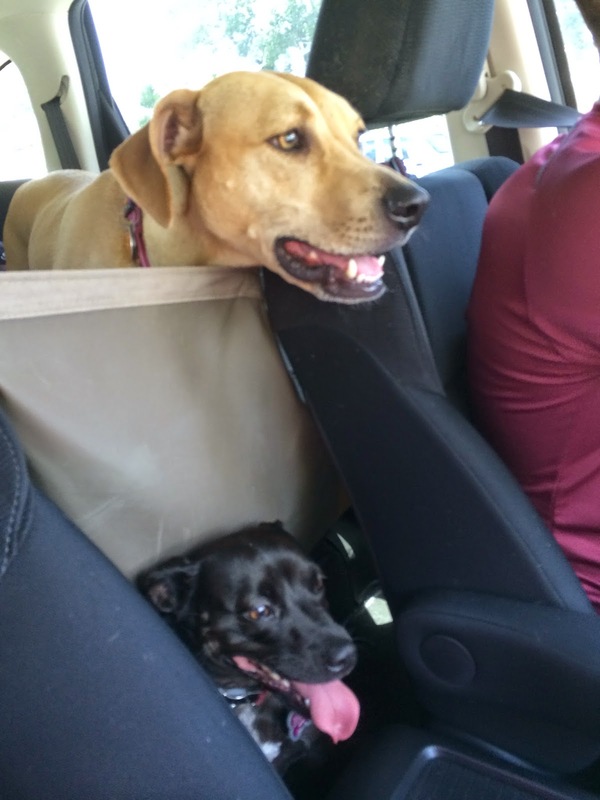 Before Darla came around, we thought about adopting another dog many, many times. The big reason was we just wanted to save another dog. Jenny is a rescue, and we will likely always go through rescues and shelters in the future, which is a just a personal decision. Overall, going from owning one dog to two isn't earth-shattering. It is an adjustment, but the pros outweigh the cons. Have you ever added another pet to the mix? I wish I had even one pup. 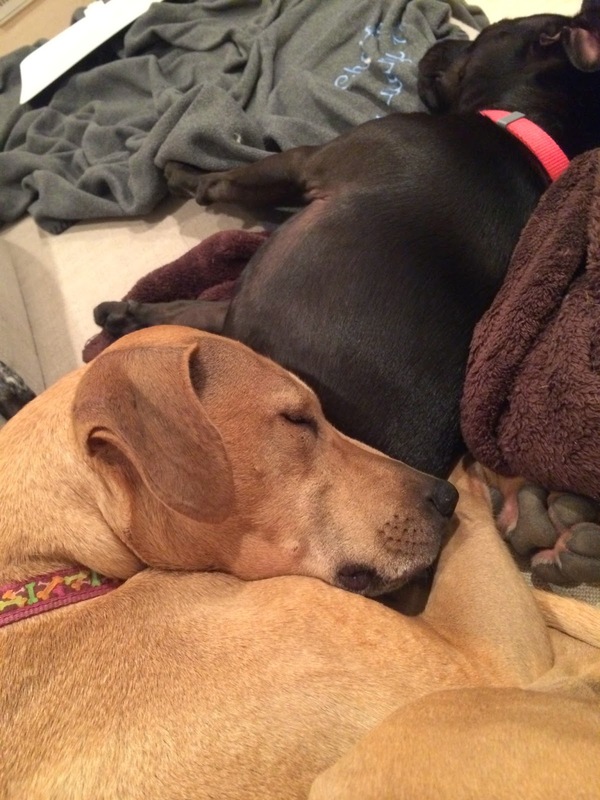 You are such good people to rescue both of these dogs and to love them. Happy adjusting! It is so amazing how two dogs can be so different. I'm glad Jenny has a playmate and Darla has a good home while her mom is away! It's so great that y'all were willing to open up your home and take in her dog! Love this! Since the mister and I moved in together in 2011, it's been one of our dreams to rescue a dog, but every place we lived at just aren't pet-friendly. Now we live in Hawai'i and to me is the worst place to find a rental that allows pets! And I begin to torture myself by following the Hawaiian Humane Society and Oahu SPCA, I wish rentals were more friendly about it. Hoping for the next place! I'm glad I read this yesterday- my husband came home last night and asked how I felt about keeping his best friend's dog while he was deployed. We got a lab puppy in April and are preparing to move to Jacksonville after my husband wings next month, and I guess now we're taking in another fur child for an unknown amount of time. 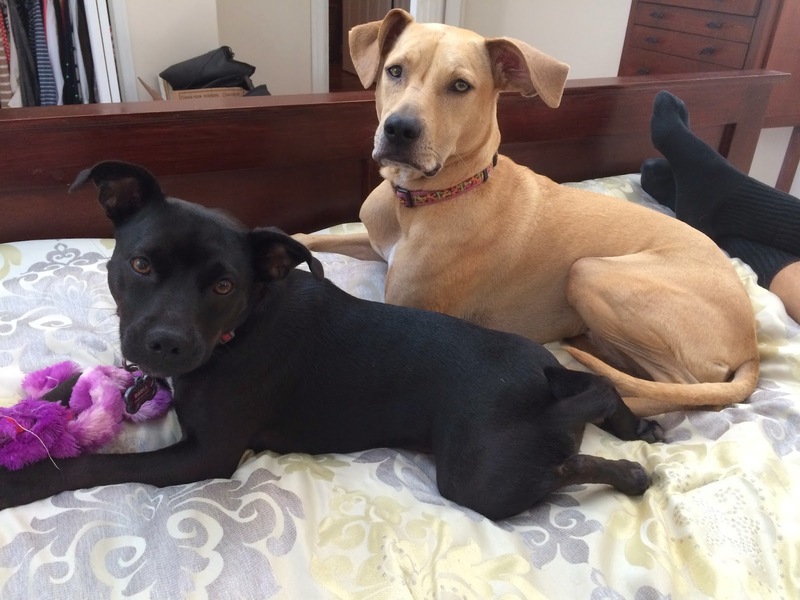 Fingers crossed our pups hit it off as well as Jenny and Darla seem to have. I'm sure our little guy will love having a built in buddy. They are both so cute!!! Having a second dog is seriously the best decision we've ever made. We don't feel as badly if were gone for a long period of time because they have each other. You're exactly right about the Built in playmate. When we don't have time for a walk or to take them running they still have each other to wear out. Not to mention the weather cuddle is beyond adorable. There obviously comes for me the biggest is the additional money. More food more vet. But I'm so happy that you took her in. She is definitely super cute. Seriously, the cow getting run over by a lawnmower part had me dying! We have two dogs and Bailey is SO noisy when she plays. It makes it impossible to hear anything ha ha. Goodness, you are right that the noise is a huge adjustment. Ours are noisy players too. Once you get over that adjustment hump, I have loved every second of having two pups.